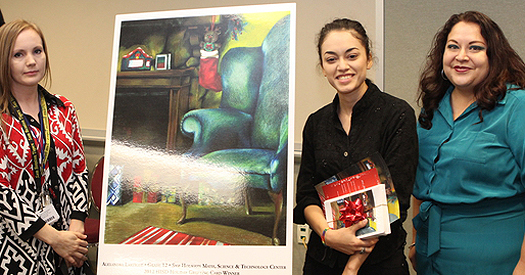 Alexandra Lartigue , a senior at Sam Houston’s Math, Science and Technology Center, created the winning artwork for the 2012 HISD Holiday Greeting Card. Along with their families, art teachers, and principals, the finalists were honored at a reception Friday, Nov. 2, at the Hattie Mae White Educational Support Center. Thirty talented student artists from around the district participated in the ninth annual HISD Holiday Greeting Card Event. Students from elementary, middle, and high schools submitted holiday-inspired artwork with the hopes of being selected as the official HISD greeting card artist. A fireplace, stocking, presents, and a blue chair form a vibrant backdrop for the 2012 HISD holiday greeting card, which can be ordered in time for the holidays. This year, Lartigue was inspired by holiday surroundings and chose a living room setting for the greeting card background. Lartigue says establishing her art has been a lifelong dream, and she is currently pursuing her college options. “I am so proud of her. Students like her give us motivation to keep teaching,” said her art teacher, Wendy Bejarano. All finalists received holiday greeting cards featuring their artwork to give to family and friends this holiday season. A photo gallery of the finalists’ designs is available at http://www.houstonisd.org. All of the finalist holiday cards are available for purchase by submitting this order form.